Features	: fully furnished 1 bedroom apartment with a roof terrace. 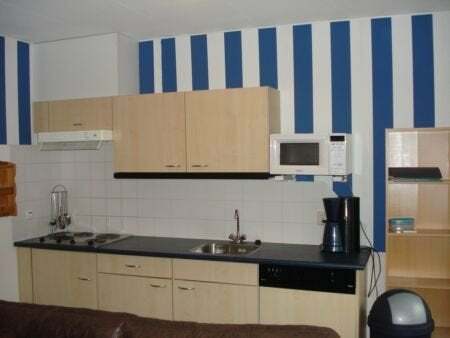 The apartment is situated on short distance to public transport and close to CS and to all exit ways and in the centre of Haarlem. It is a small apartment block with bicycle shed, washhouse with 4 washing machines and 4 dryer and a large roof terrace for general use and a storage place. It is very well maintained and modern furnished and provided with all comfort. The Kitchen is with build-in equipment like ceramic cooking, cooker hood, fridge and dish washer and etc. The apartment is suited on the 1st floor and has double glass and central heating. The apartment will be cleaned free once a week. Lay out: down floor: main entrance, bicycle shed. 1st floor: wash house, storage place, entrance apartment: hall, bathroom with wash basin, toilet and shower, living room with a open build-in kitchen with equipment and a large storage closet, bedroom. 2nd floor: large roof terrace for general use.